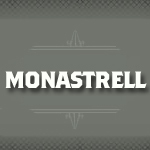 Monastrell is a red wine grape often found in Spain, France, California, and Australia. It's a thick skinned berry that produces richly colored wines with high tannic profiles. For these reasons, Monastrell is often used as a blending grape to soften the sometimes overpowering flavors.